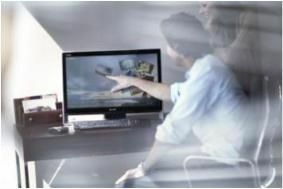 Sony launches VAIO L Series media PC with full HD touchscreen | What Hi-Fi? Nevertheless, Sony's latest effort, the VAIO L Series, certainly sounds good on paper. The focal point is the 24in X-black LCD display, complete with 1920 x 1080 full HD resolution and touchscreen controls. Using the touchpanel support within Windows 7 you can navigate your way around the built-in hard disk to access videos, images, music and more. Offered with a built-in Blu-ray disk reader/burner, HDMI inputs and integrated speakers and digital amplifier, it's hoping to be your home cinema hub. Software on board includes a new Music Player and Media Gallery, plus VAIO Movie Story for editing your own content. It's all accessed via the VAIO Gate interface. The Sony VAIO L Series media PC will be available from the 22nd of October 2009.